Relax in the comfort of a newly renovated Batch with modern decor. 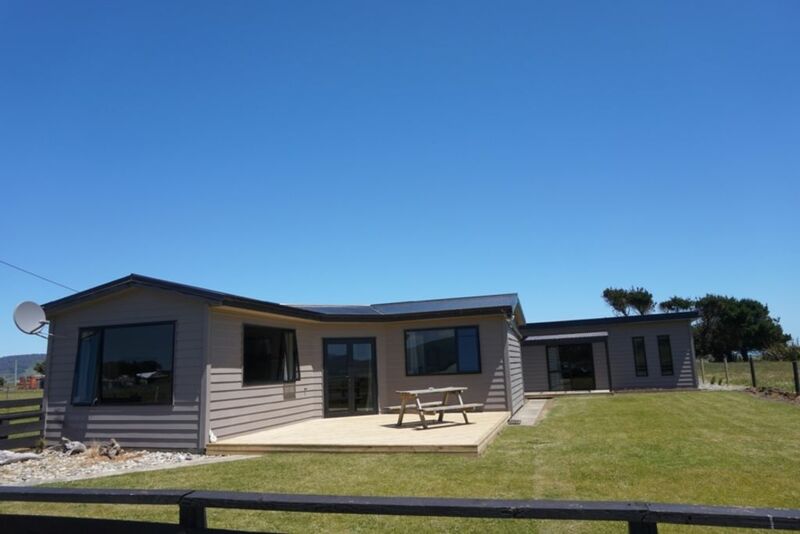 Orepuki Retreat is self contained, clean and has all the creature comforts of home including Sky TV and Sports. Riverton is a 20 minute drive or Tuatapere is 15 minutes and both offer all the amenities you will need.re. Take a stroll to the beach, only a short five minute walk or a bit further to Monkey Island. Monkey Island is accessible at low tide, only a five minute drive or half an hour walk south along the beach and take in the stunning views on the way. Orepuki Tavern is only a two minute walk and has amenities such and Milk and Bread and free Wifi, while the Orepuki Beach Cafe offers a vast menu to please most taste buds. Please note that all dog poo is to be picked up before departure. Great wee place. Clean, tidy and warm it has everything you need for a relaxing stay. Loved our stay while exploring the area. Orepuki Retreat. Warm, Cozy, Comfortable. Our family of four adults and two children spent two nights over a long weekend at the Orepuki Retreat. This accommodation met all of our needs. A well laid out, roomy kitchen with open plan living flowing naturally from it meant we could be all together when we wished. The sleeping quarters both in the main unit and the outside unit are comfy and convenient. There are nice touches such as games for the children and a barbecue with gas supplied. The kids enjoyed playing in the large yard and the family loved the fact that they could visit a beach very close to the retreat or travel short distances to other beaches. Monkey Island was a highlight. We also loved the cafe which we walked to just up the road. For us, a perfect stopping off place and hub for a visit to a stunning part of the country. We hope to return. Murray Radka. Thanks for your awesome review. Glad you and your family enjoyed your stay and the crib fullfilled your needs. Monkey island is a highlight and is great place to spend exploring. This was our second stay at Orepuki, the accommodation was clean and while we did have an issue with the water this was fixed promptly. Met Corrina the property manager who was very friendly and most accommodating. Walking distance (if its fine and not raining) to beaches and pub. Tranquil setting, very homely. Easy access to beautiful beaches. Definitely recommend this Bach. Thanks sue for your review, I am glad you enjoyed your stay. Great spot with plenty nearby to see and do. Great cafe just down the road and hard case locals in the pub. Thanks for the review. It is defiantly a great spot to go and a very relaxed community.